- Publisher The 31 short, easy-to-read chapters in "Restore My Soul" compassionately address some of the most pressing questions and issues facing someone who recently has experienced a deep loss. Each chapter contains a brief reflection on an issue of loss, followed by carefully selected Scripture readings and a suggested prayer. This guide provides gentle help for those looking to put back together the pieces of a life shattered by loss. - Publisher The stunning range of emotions after the loss of a loved one can be overwhelming and paralyzing. This book is a guide for facing and understanding feelings and for thinking through new ways to cope with life in the aftermath of loss. The 31 short, easy-to-read chapters in "Restore My Soul" compassionately address some of the most pressing questions and issues facing someone who recently has experienced a deep loss. Each chapter contains a brief reflection on an issue of loss, followed by carefully selected Scripture readings and a suggested prayer. 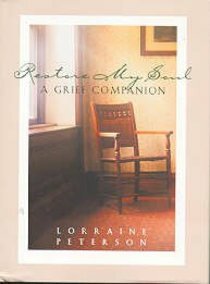 This guide provides gentle help for those looking to put back together the pieces of a life shattered by loss. The stunning range of emotions after the loss of a loved one can be overwhelming and paralyzing. This book is a guide for facing and understanding feelings and for thinking through new ways to cope with life in the aftermath of loss.